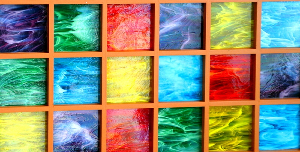 Glass block crafts and walls can add stunning and stylish features to himes and businesses. Constructing walls made from glass blocks is a popular way of creating both exterior and interior walls. It is also a way of bringing light into a room whilst maintaining privacy. 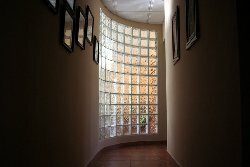 versatile and can be used to create straight or curved walls creating a division between rooms whilst allowing light into dark corners. Adding clever lighting can produce a dramatic effect to any room. They are also being used to construct shower screens and garden features. Coloured blocks can be used to create a unique style. There are companies who specialise in manufacturing bespoke glass blocks. Images can be fused onto the surfact of a single block creating a small feature within the wall. This can be repeated at various positions within the wall creating a patteern of either the same image or multiple images. An image can also be taken and stretched over an entire glass wall. Constructing a wall like this has unlimited possibilities and will inspire a unique design feature in any home or commercial building. There are various ways of constructing glass block walls and the method used will depend on whether the wall is interior or exterior, whether it is to be curved or straight and whether it is to be freestanding or fixed between existing walls.